By Neilson Watts (Product Manager, Sage One Payroll). Oh yeah baby – I’m in payslip heaven because of our new Payslip Improvements in Sage One Payroll! Oh man…I thought this day would never come…it’s made me sooooooo happy! Ok, I’m easily pleased, but I hope these payslip improvements put a smile on your face too. So how can I email my payslips to my employees? It’s really quite straight forward…in the Personal Details section of each employee’s record you will find “E-mail” and “Password” fields. Just make sure you use a valid email address and enter the password your employee wants to use (you need to ensure a minimum of 8 characters). Once you’ve completed your payroll run, you can either send each individuals payslip separately by clicking the envelope icon next to their name and net pay. Alternatively, to send all payslips en mass to each employee at the click of a button, simply click on the ‘Export All Payslips’ dropdown choose ‘Email Payslips’. You’ll then get an opportunity to enter a text that will appear in the body of the email message for your employee’s payslip (see screenshots below). When your employee receives their email with the payslip attached, they simply double click the PDF attachment and they will be prompted to enter their password. (Note: payslips are sent in Adobe Acrobat PDF file format. If your employee does not have Adobe installed on their PC, they can download a free Adobe Viewer tool from www.adobe.com/uk/products/reader.html). So how can I choose one of the new payslip templates? We’ve created two new payslip templates designed around our popular payslip stationery we sell for our desktop payroll software. The great news is that we’ve created them so you don’t need to purchase any stationery, but they look like they’ve been printed to stationery. then click the ‘Change Template’ button. You’ll now have the choice of 3 different templates (see example of one below). As you can see from the payslip image above, your employees can now track how much they have been paid gross, the tax and national insurance they’ve accrued or paid to date during the tax year. We’ve also updated the detailed report to include ‘Section 7 – Year to Date’ (see screenshot below). 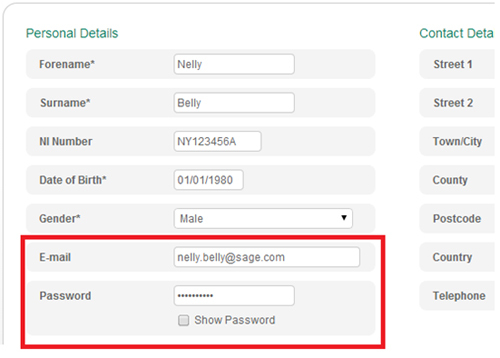 If you’re an existing Sage One Payroll user, we hope you like our latest changes and would love to read your feedback in the Comments box below. I’m using Sage one Ireland, and payslip setting options not shown on screen when i go into the Payroll 5 settings options. Help!